I read a lot of books over the course of year, some of which are skimmed throughly and some of which I hang on to every word, highlighting all of the things I want to share with the world. A book I’ve been reading recently, Deep Nutrition, is one such that will soon be marked up with yellow highlighter marks as soon as I get my own copy and return the one borrowed from the library- it’s way more than I expected it to be. As many of you who avidly read my work know, I’m a huge advocate for real food, particularly traditional foods that have been available for centuries to every culture around the world. It all started with my first trip to Italy (aka: gastronomic heaven) as a young woman where I became obsessed with the idea that food grown with chemicals, mass-produced and shipped around the globe was not the kind of food that would provide great nutritional value- yet it seemed that most nutritionists and doctors weren’t addressing this fact, although everyone seemed to be recommending the Mediterranean Diet’ as the best in the world, even marketing it as such. That’s not something I bought into so easily. Yes, I love Mediterranean food and it sits well with me, I believe, because a large portion of my DNA has origins in Southern Europe. That doesn’t mean it’s the right diet for everyone– or so my instincts told me, and exactly what this book addresses, too. I’ve also been an advocate of the Wise Traditions publication, a quarterly one produced by the Weston A. Price Foundation, because of their responsible and extensive research on traditional food and medicine as it intersects with modern day treatment and healing methods that the average person can wrap their heads around- and they also lobby for good in Washington, D.C., not because they’re being paid to lobby or advocate for a certain ingredient. 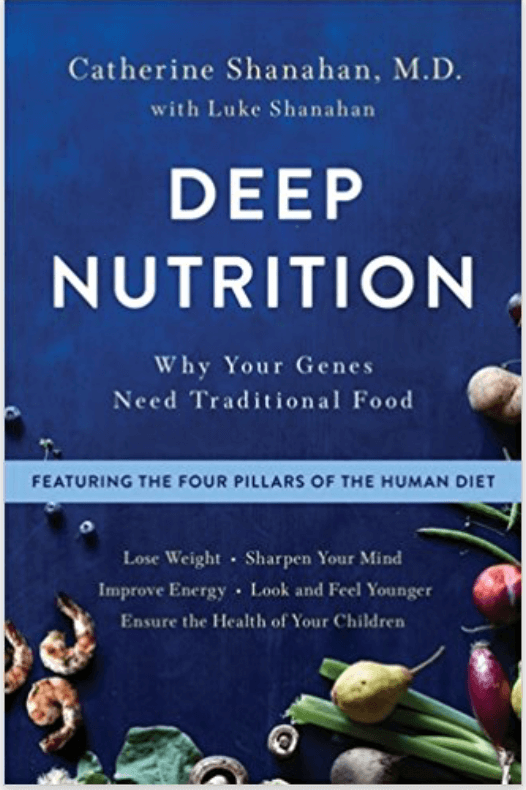 Deep Nutrition: Why Your Genes Need Traditional Food (Featuring the Four Pillars of the Human Diet) by Catherine Shanahan, M.D. with Luke Shanahan is one of those books I believe every parent, every adult with chronic illness, and anyone who cares about their health and the health of their families, should be reading. That’s a pretty tall order. But, I like it. I’ve never been a believer in diets; only lifestyle changes- sometimes ones that need to be massive in order to be not only effective, but also transformative and long-lasting. This makes a lot of sense to me. For those of you who have pets, think about what you see nowadays in the pet food stores or aisle- a lot of marketing (i.e. descriptions of the best characteristics of a particular pet food) being described as “biologically appropriate” for cats or dogs. Scientists and nutritionists are just now also talking about how the diet of our fur babies are also being afflicted by the type of food and as a result we’re even seeing an increase in obesity and diabetes in the feline and canine world. That’s astonishing! What have the holistic pet nutritionists and veterinarians done to curb this? They’ve created biologically appropriate food mixes that address what cats and dogs are supposed to eat- what they would naturally eat in the wild, what’s good for them and doesn’t make them sick but instead makes them thrive, makes their hair shine and keeps them healthy and living long, happy lives. Why don’t we have the same thing going on in the human food system? I love the insight and personal experience that Dr. There are other additions and resources at the end of the book, which are all very valuable to the reader, including which types of products to buy for a healthy, deep nutrition type of lifestyle but also where to go online to read more and find those items. Perhaps once I’m actually thoroughly finished reading the book, I’ll come back with more insights, but for now I think it’s got enough excellent information and research to keep me interested and learning more about this crucially important topic- now, more than ever. This entry was posted in Book Reviews, deep nutrition, nutrition, traditional foods, Weston A. Price Foundation, Yvonne's Blog. Bookmark the permalink.